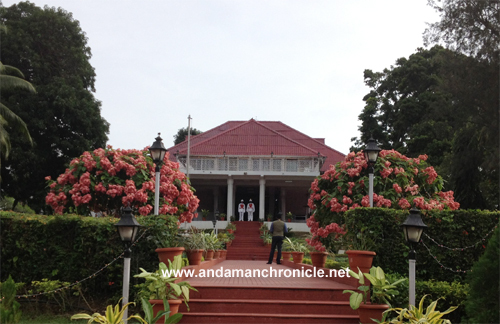 Port Blair, Dec. 31: Raj Niwas, the official residence of the Lieutenant Governor of the A&N Islands, will now be thrown open to the school children. The Lt Governor, Lt Gen (Retd) A. K. Singh has decided to open the gates of Raj Niwas for school children so that the children of the Islands can get a chance to visit Raj Niwas and learn about the historical building and the rich bio-diversity of the place, which is home to varied species of plants and flowers. A newly developed eco-walk has been added to the attractions of Raj Niwas. According to Raj Niwas children from various schools will be invited to visit Raj Niwas on the last Saturday of every month. The Education Department will work out the modalities in this regard. Located in the middle of exquisitely landscaped gardens, Raj Niwas is an example of colonial architecture. It was built in the 1870s as the official residence of the Deputy Superintendent of the Andaman Penal Settlement (later Deputy Commissioner of the Andaman and Nicobar Islands). Having a large variety of horticulture flowers, ornamental plant species and fruits, spices, medicinal plants and vegetables gardens, the Raj Niwas visit will prove to be a good education and motivation for the children. The school children will also get an opportunity to meet the Lt Governor and interact with him.